I like to play the piano. It’s my hobby. When I decided to buy a new keyboard, I chose M-Audio Keystation 88es. As a simple MIDI keyboard, it doesn’t have any audio generation hardware. You can only connect it to a computer and generate sound there. I typically use the Apple GarageBand — special software has a vast library of sounds. But the size of the library is quite big. For example, Garage Band needs to download more than 1.5GB of data to start playing, and smaller MIDI clients have smaller libraries and worst quality of the sounds. 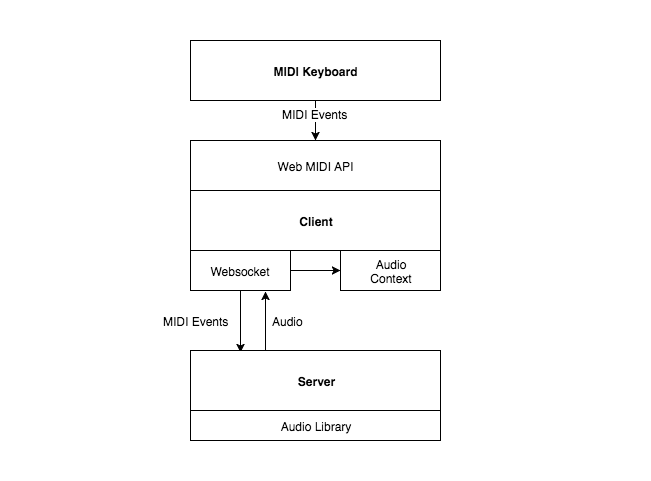 Using Web MIDI API and simple Node JS server we can build small web client and a big library of good quality sounds. With the Web MIDI API we can easily receive the pads and sustain pressing. This data I will send to server using the Binary WebSocket Stream. The server generates an audio and sends it back to the clients using the streams. This stream is processing by an AudioContext to play the sound in a browser. Next, let’s add some code to handle MIDI events. MIDI event has a data property with three numbers: status, data1, data2. For instance, we have status equals 0x90 — keyboard pressing event. For this event data1 is a tone, data2 is velocity. midiAccess.inputs.values() returns an iterator object. So you can easily iterate over all of the inputs. We will use only first input. Now we need to send events to a server using BinaryJs. WebSocket — is a long living connection between client and server. It provides faster data transfers than HTTP, because connection is not setting every time. And modify a little bit handleMidiMessage method to send handled MIDI Events to the stream. We need to add a socket handler to the server side. Let’s use BinaryJs for the server also. To generate audio we need a library of the sounds. I’ve found free sounds in the Github public repo and renamed the files to make them equal to the key codes of the piano pads. Further, we have to read the sounds when a server receives the key code and return audio stream to the client. For now, we read a sound from a file for each request, but it can be optimized with a cache. When the client receives an audio stream, it needs to handle the new data and send it to the AudioContext for playing and mixing (if several sounds are playing at the same time). Now it’s time to think about latency. Let’s add the time logs from sent key codes to receive audio. For local application, latency is around 12–20ms (depend on device). Collaborations. Let’s add support for multiple clients connected to the same server. All connected client will be able to play, and all users will listen to each other. It’s like an online jam. On the server side, we need to update our play callback. Next, we need to update our client. It now needs to be ready for the new streams, that are creating from the server. That’s all. Now our application supports multiple clients. And users can play together. I like Heroku for my projects because it is free and easy to use. Unfortunately, it has some limitations. One of them is that we can have only one external port. So to deploy our application to Heroku, we need to handle HTTP and WebSocket connections on the same port. We updated the binaryServer options. For now, Express server and WebSocket server are listening on the same port. We’ve created a simple web synthesizer with piano sounds. It works pretty fine locally but has latency in a Heroku deployment. How can we reduce the latency? Hmm. We can try to split our samples into several chunks and then reduce time to download of the first chunk.